According to Obama and the Democrats, the Little Sister of the Poor are enemies of the state. As Orthodox Jews and Conservative Republicans, Karen and I have discovered that our values align closely with Conservative Christians of all denominations. In fact, Karen and I agree that we have far more in common with Conservative Christians than with liberal, secular Jews. I have a particular weakness for nuns. One of my most rewarding projects was a film for Showtime, Within These Walls, starring Ellen Burstyn and Laura Dern. It’s about Sister Pauline, who pioneered a project for female prisoners to train dogs for the disabled. I was, to say the least, skeptical of the program. It sounded like one of those do-good liberal projects that have lovely intentions but crash and burn in the real world. Soon, and much to my delight, I discovered that the program is a success. I spent a good deal of time in a female prison doing primary research. And don’t let Orange is the New Black fool you. Women’s prisons are not like a Barnard dorm. They are a Hobbesian universe. I also interviewed Sister Pauline at length. She was a fascinating woman, horribly damaged in her youth by unspeakable abuse, but rescued, she told me, by her love for Jesus and the companionship of dogs. There’s another thing that really gets me about nuns: their outfits. I think the traditional garb, in all its permutations, are fashionable. The flowing silhouette, exacting proportions, and limited color palette are the uniform of faith. Fashion that transcends fashion. The liberal nuns who strut about in jeans and Betty Friedan t-shirts are a bore. A nun in a mantle and wimple gets my immediate attention and respect. 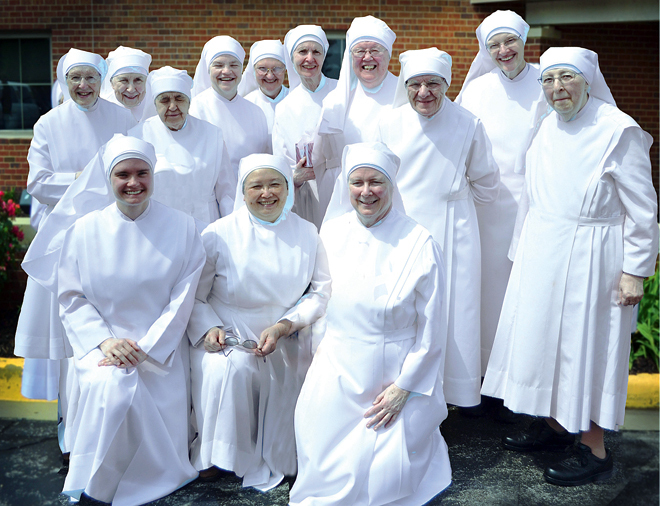 Obama and the Democrats are going to war against the Little Sisters of the Poor, a Catholic order who do more good in one hour than Barack Obama has done in his entire career. And no matter the outcome in court, Obama and the Democrats lose. Seraphic Disclaimer: This post contains some language that is a bit, actually, a lot more graphic than is normally found in Seraphic Secret. So if you are young, under 18, religiously modest, or secularly modest, the following, which deals with life in a women’s prison, might not be appropriate reading matter for you. Note: Links to previous chapters at the end of this post. The Screenwriter and the Corrections Officer are sitting on a bench, chatting. C.O. Cindy is curious about Hollywood prison movies. Robert has promised to compile a list of his favorites. Screenwriter and C.O. share a companionable relationship that is occasionally rattled by Cindy’s insatiable curiosity about her Hollywood visitor’s private life. It’s lunch time, and I’ve scheduled an interview with Cindy. I’ve been hired to write a film, Within These Walls, for Lifetime Network about the prison pet program. Cindy has been my guide, my babysitter, my bodyguard, my eyes into this world—hidden from the real world—and the female inmates who inhabit this violent place.